The photo-sharing platform's growth has far surpassed that of most of its rivals thanks to near-flawless execution. But Facebook's support and other factors have also played a role. When it comes to user growth, Facebook Inc.'s (FB - Get Report) Instagram is nearly unparalleled. As of September, the photo-sharing platform had nearly 2.5 times as many monthly active users (MAUs) as Twitter Inc. (TWTR - Get Report) , and close to three times as many daily active users (DAUs) as Snap Inc.'s (SNAP - Get Report) Snapchat. More generally, it had at least twice as many users as any social platform not owned by Facebook, China's Tencent (TCEHY or -- if one counts YouTube -- Alphabet Inc./Google (GOOGL - Get Report) . And about half of these users have been added since the fall of 2015. What's fueled Instagram's manic growth? Chalk it up a mixture of good positioning, very good execution and the benefits that come from having Mark Zuckerberg's company as a parent. 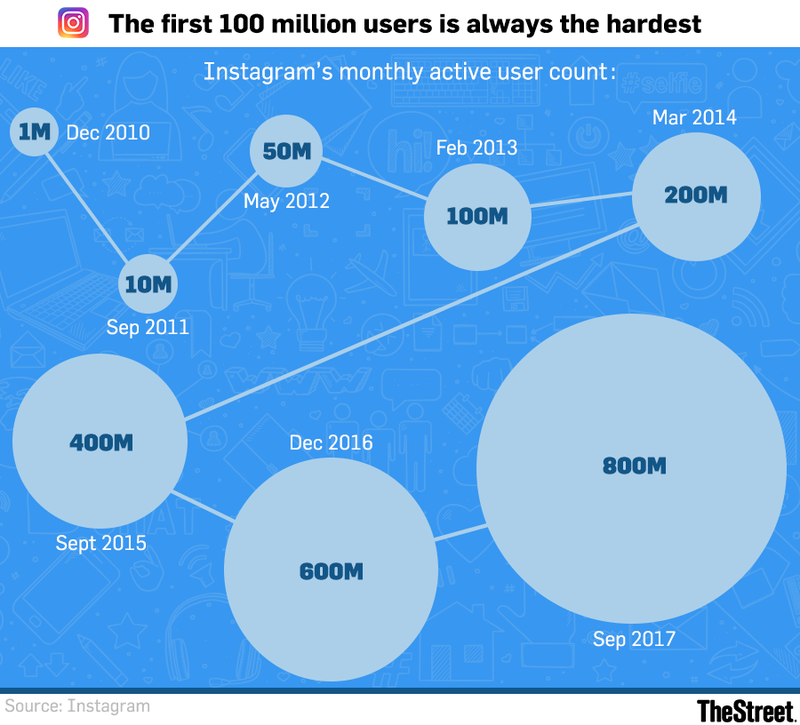 A lot can be written about the missteps made by Twitter that have contributed to its user growth so badly trailing Instagram's over the last few years. But at some level, it may have been inevitable that a well-run social platform centered around sharing quality photos and videos, with text as a complement, would appeal to a larger base of people than one centered around the opposite -- i.e. sharing small pieces of text, complemented by photos and videos. There's a reason why cameras tend to be one of the primary selling points for $700-plus smartphones, if not the primary one. And also why so many consumers spend several hours per day watching long-form video of some kind. Or why YouTube's mostly short-form videos now see over a billion hours per day of viewing. In both traditional and social media, images trump text in terms of popular appeal and revenue-generating potential. One of the big reasons why Twitter sees so many users quit after a short while, or perhaps stop posting and merely follow celebrities and media personalities, is that it can feel like a very solitary experience for the average user. Instagram has sidestepped this problem in large part thanks to its ability to access Facebook's massive social graph. A user starting an Instagram account can quickly follow any of his or her Facebook "friends" who are on the platform, and is later notified when a friend who previously wasn't on Instagram has joined. As a result, most "regular" Instagram users can expect to get a healthy number of likes addnd comments for their content, which in turn encourages them to share more. Facebook's engineering talent and data centers have also aided Instagram, helping keep its infrastructure costs relatively low and allowing it to roll out demanding services such as live streaming. It also doesn't hurt that Facebook proper's massive profits make it easy for Instagram to absorb short-term losses for the sake of growth. Snap has suggested it's not trying hard for now to grow its user base in emerging markets where consumers are tough to monetize, due to the cost of supporting them. For its part, Instagram doesn't have to worry about making such a compromise. Though Twitter can be great for news junkies, celebrity-followers and those wanting to track big events in real-time, user Timelines are often filled to the brim with negativity, snark and sarcastic one-liners (much of it politically-themed). And though Facebook has a more positive feel to it and still does a lot to keep users connected with friends and family, there's still a tendency for Facebook's news feeds to contain a healthy dose of both news/political content and status updates related to mundane events, often with a healthy amount of self-censorship. By contrast, Instagram keeps the snark and political rants to a minimum, and encourages users to share aesthetically-pleasing material. And -- through its Explore tab and other mechanisms -- it does a pretty good job of helping users discover such content. Instagram's main feed provides a venue for sharing carefully-edited material that one is comfortable permanently attaching to a profile and which can produce likes/comments, while its Stories feature offers a means of sharing content one would prefer to vanish within 24 hours, without any likes or public comments. Its platform allows both regular users and celebrities/brands to create public accounts that can be discovered and followed by strangers, but also supports private accounts that only approved users can view, as well as (unlike Facebook) the use of pseudonyms. And whereas Snapchat has opted for a quirky interface that encourages rapid content creation and sharing, but which can seem confusing to many older users, Instagram opts for a UI that's bound to look familiar to the average Facebook user, yet still makes it fairly easy to create and share. In so many ways, Instagram has carved out a happy middle ground between what other social platforms attempt to do. Zuckerberg's old "move fast and break things" mantra for Facebook's product work (later tweaked to "move fast with stable infrastructure") could just as well apply to Instagram. In 2016, the platform switched from a reverse-chronological feed to an algorithmic feed, and soon afterwards launched a Snapchat Stories clone, placing it at the top of its home tab. Considering Instagram has added over 300 million MAUs since June 2016, it's hard to complain about either move. Other moves, such as the Explore tab and an option for privately saving posts, also drive home Instagram's unwillingness to rest on its laurels. So, too, does a recent report stating Instagram is testing several new features, including options to re-share older posts, add GIFs to Stories and create a list of one's closest friends. As Facebook has gotten serious about monetizing Instagram with the help of mountains of user data, quality targeting/measurement tools and options for running cross-platform campaigns that cover both Facebook and Instagram, Instagram's revenue (not disclosed by Facebook) also appears to be taking off. Research firm eMarketer has forecast 2017 sales of $3.92 billion, up over 100% from 2016 levels. It's safe to say at this point that Facebook's $1 billion 2012 purchase of Instagram qualifies as one of the shrewdest tech acquisitions in history -- all the moreso given the indirect challenge Instagram posed to Facebook's core business. But it would be a mistake to overlook how much of a role Facebook has played in the success Instagram has seen since the acquisition. Whether in terms of providing needed resources, helping Instagram monetize or empowering a management team led by CEO Kevin Systrom to make big moves and focus on the long-term.